Utility company did poor job in resurfacing street. Road is bumpy and gaps on border. I have just reached out to PSE&G to obtain an update on the road restoration. No photo since I already walked past, but the street lights are out on Jersey Ave & Grand St! I almost saw two accidents and had difficulty crossing the street. Someone should get there to help direct traffic & pedestrians! This complaint reads more like a Traffic lights and not streetlights. This will be sent to Traffic and Engineering. 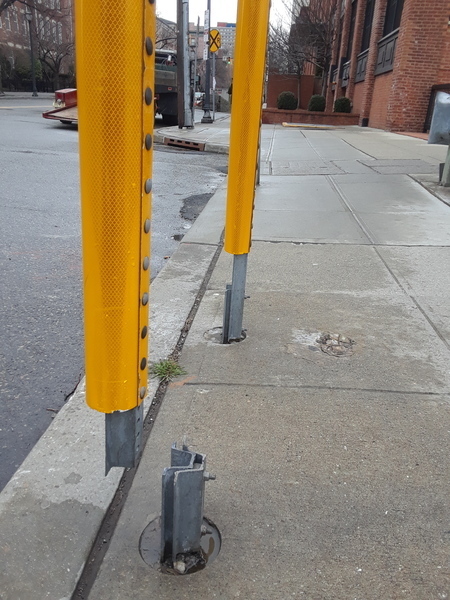 This issue was recategorized from Streets: Streetlights to Traffic and Parking signage/signal issue. The base of this sign is unfastened. The right side screw is missing. The way Regional Industries conducts their business is absolutely atrocious and borderline abusive to the residents of Downtown, Jersey City. Not only do they start their collection around midnight and run their operation until about 5-6AM seemingly every night, they aren't even efficient about the entire process. I've seen their trucks idling in front of my building at all hours of the night. I can't even open my windows due to the exhaust. I've seen their workers yelling at each other, jump off the truck to sprint down the street for no apparent reason, back up down the street instead of driving around the block, and block traffic entirely. I swear sometimes I think they throw away two bottles at a time just to make a racket. I haven't been able to get a decent night's sleep for months now and it's affecting my home life. I know (based off of other articles on this site: https://seeclickfix.com/issues/3724729-trash-collection?locale=en) that I am not the only person who is sick and tired of it. This issue is UNRESOLVED and action needs to be taken. This issue needs visibility. I will start documenting such behavior, and I need to know who I should be forwarding it to. Monday, 04-22-19 Please be advised that this is not a Division of Commerce issue. This is taking way green space. Zoning would have to make a determination. really green space this person was parking there for several years now suddenly you are thinking about green space, how much green are you with envy. A resident called saying the owner at the address provided takes out their trash before the required time frequently.